One of the highlighted additions to the Common Core Standards is the focus on informational text. Students are required to demonstrate comprehension of such text as well as the ability to produce written text grounded in research, analysis and argumentation. In order to develop these skills and to prepare students for college and career readiness a paradigm shift must occur in many of our content areas. In many schools the approach to addressing this shift has been the integration of literacy instruction and application into core subjects such as social studies and science. What content must we cover? How can we integrate literacy into this process? 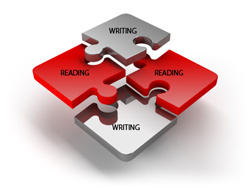 With the help of the Literacy Design Collaboraive teachers can now Flip this process in order to have a more focused approach to literacy instruction without minimizing the content. In fact, teachers who have implemented the "template tasks" developed by the LDC have discovered students develop greater and deeper content knowledge. Select the text the students will write. The task templates are available for download on the LDC website. The tasks are designed to be integrated into LA, Science or Social Studies. [Insert question] After reading _____ (literature or informational texts), write _________ (essay or substitute) that addresses the question and support your position with evidence from the text(s). L2 Be sure to acknowledge competing views. Were the achievements and growth of the Industrial Revolution Era worth the cost to society? After reading secondary and primary sources pertaining to the British Industrial Revolution, write an argumentation essay that addresses the question and support your position with evidence from the texts. Be sure to acknowledge competing views. Should animals be kept in zoos? After reading the information texts provided, write an essay that addresses the question and support your position with evidence from the texts. Be sure to acknowledge competing views. The integration of the template tasks provided by the LDC represent a paradigm shift in core content instruction. While this model has proven to be effective it requires significant PD for all. This is a great opportunity in high schools for interdisciplinary PD. Having English teachers host PD on writing instruction for content area teachers, developing common writing rubrics and developing PLC's with a focus on this topic are some ideas worth exploring.